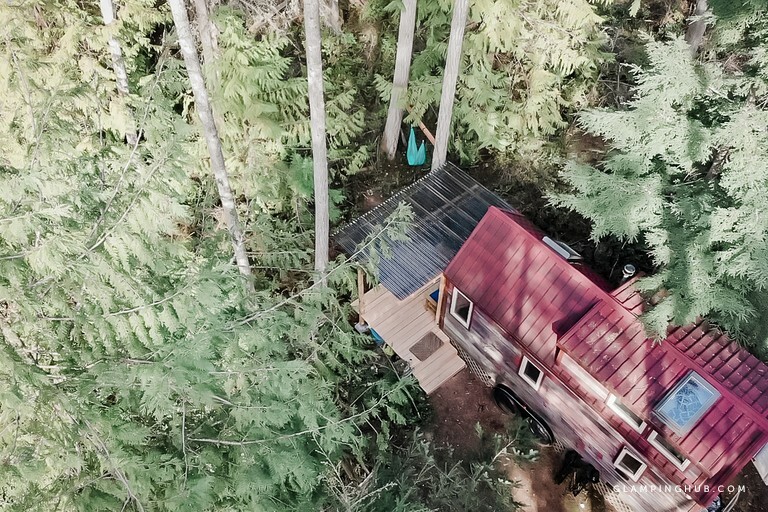 Located just moments from the heart of Clinton, Washington, this charming tiny house rental is a wonderful option for a secluded glamping vacation. 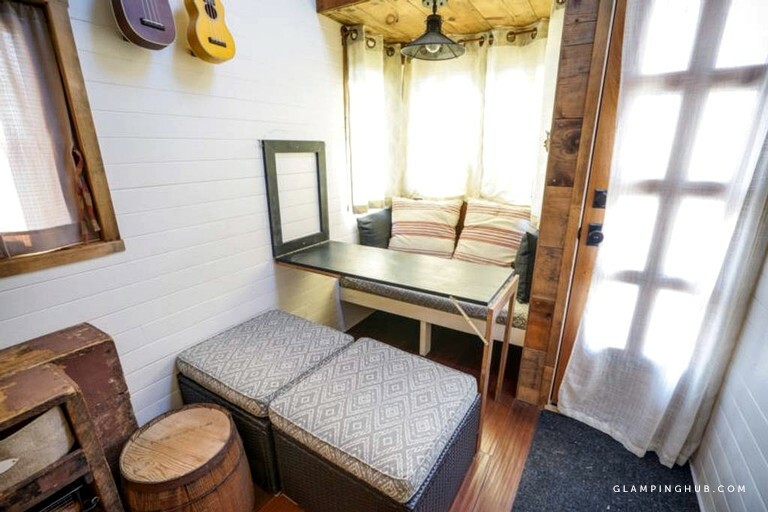 Guests will feel right at home as the interior decor offers all of the charm of a traditional farmhouse and it was also featured on HGTV's "Tiny House Big Living". 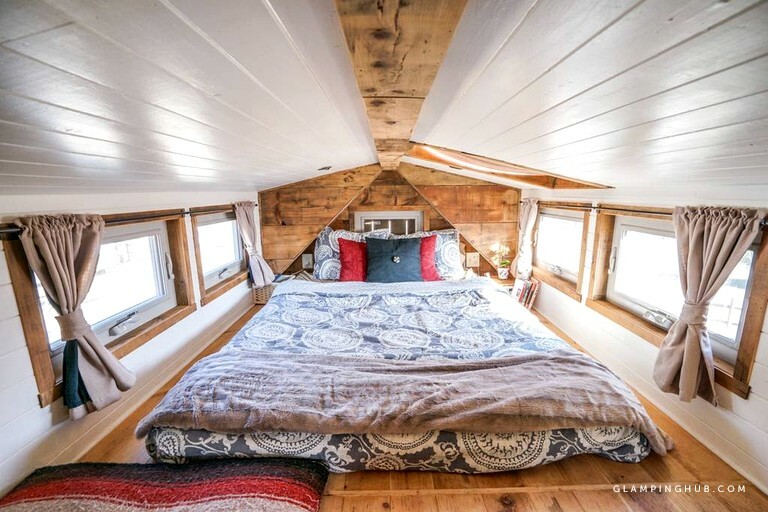 There is space to sleep four guests as the loft bedroom is home to a queen-size bed that is accessed via a steep staircase, with space to sleep two more on the full-size futon located downstairs. 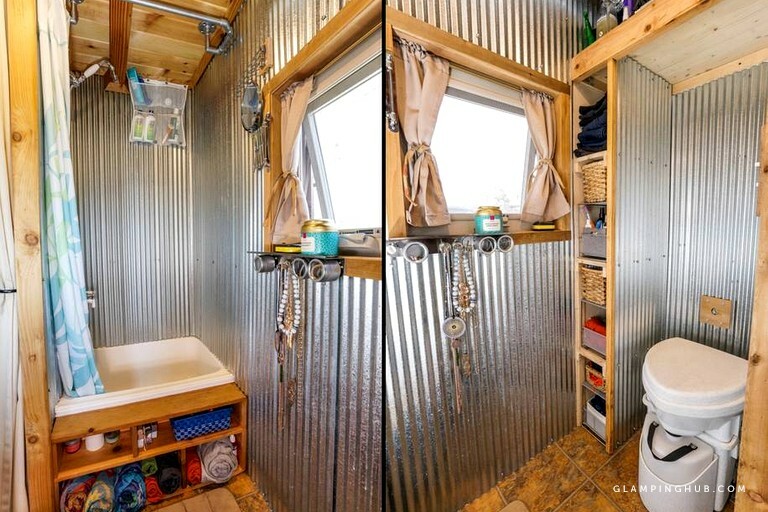 There is a small bathroom located in the back of the rental, where guests will find a shower and a small tub that can be used for bathing children or pets. There is also a waterless, top-of-the-line composting toilet that is both easy to use and eco-friendly. 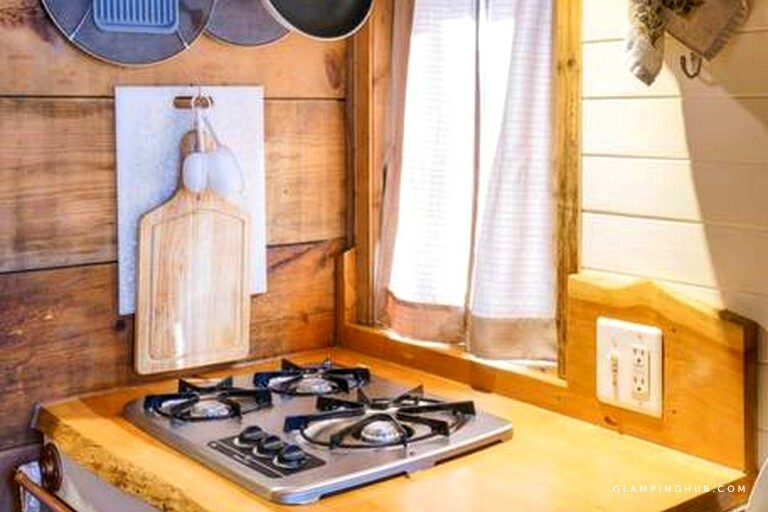 Glampers will be able to prepare all of their own meals during their vacation as the tiny house boasts a practical kitchen that is home to a three-burner propane stove, a kettle, a french press, a stovetop toaster, and also a mini-fridge with a freezer for storing drinks and snacks. 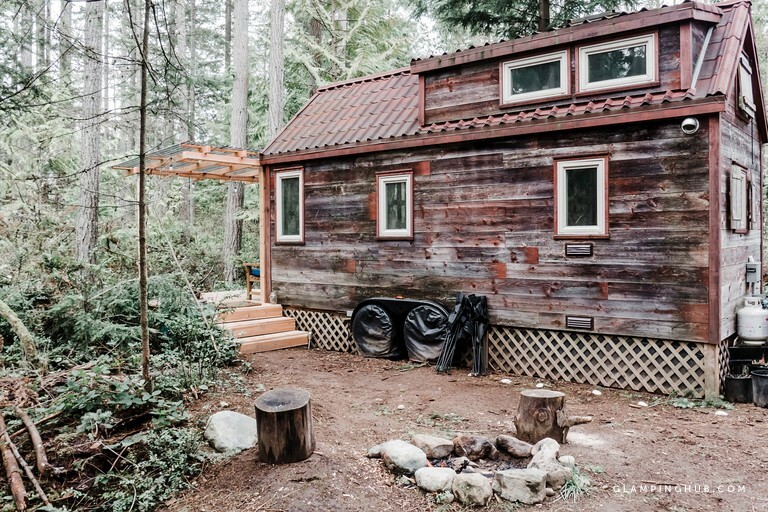 In addition, the rental is kept toasty warm thanks to the stunning stainless steel wood-burning stove inside and there is also electric heating installed for comfort. ﻿Reembolso completo. Si el huésped cancela la reserva con al menos 7 días de antelación al check-in. 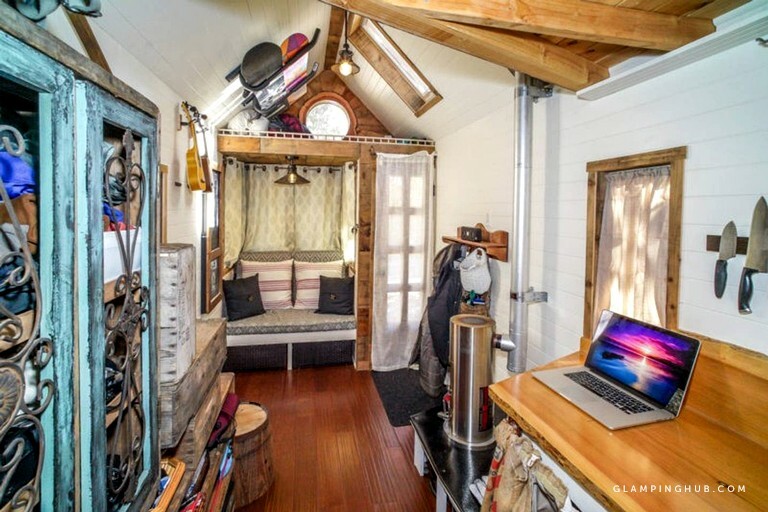 Guests will want for nothing during their vacation as the tiny house is beautifully furnished and boasts a wide range of amenities. Linens are provided for the beds and there are towels to use in the bathroom that is home to a shower and a composting toilet. In addition, there is a large projection screen inside that guests can use for watching DVDs if they fancy a relaxing evening spent inside. The hosts also supply a handful of books and games to keep guests busy. Outside, there is a large deck attached to the rental where guests can enjoy relaxing in a beautiful setting. 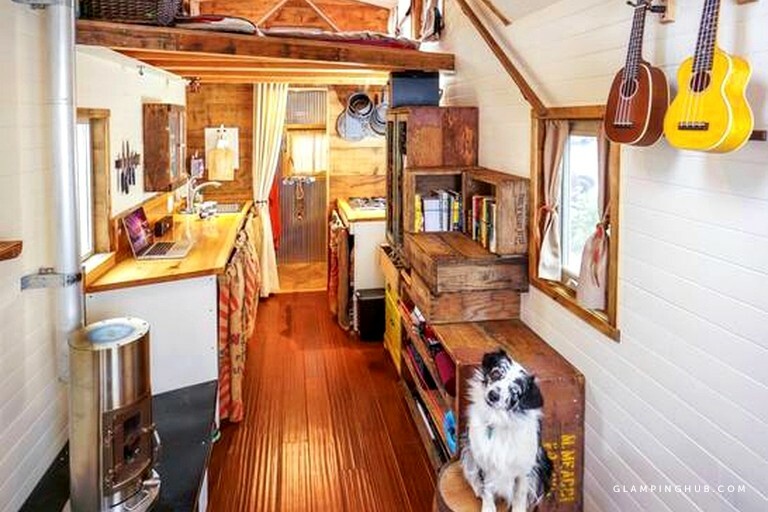 The tiny house also has a private driveway that offers space for parking. 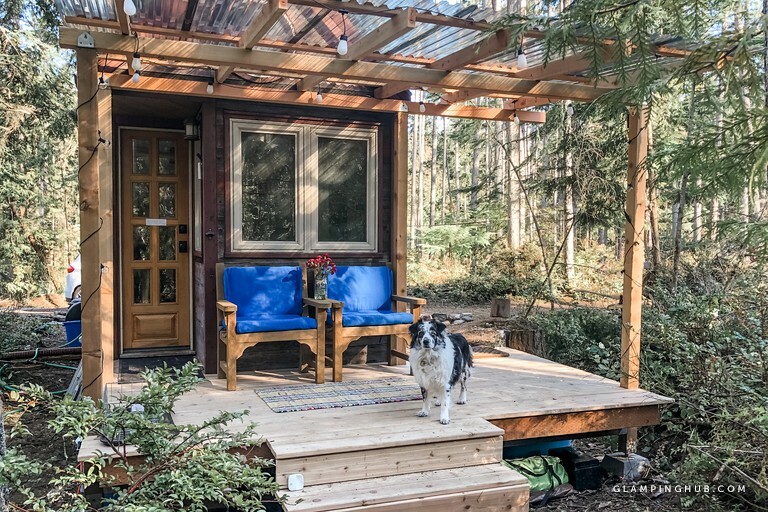 Guests are invited to spend their next getaway relaxing in this delightful tiny house rental that boasts a prime setting on Whidbey Island, Washington, just two miles from Clinton. With the ferry port so close to home, the rental is easily accessible for glampers keen to explore all that the island has to offer, and yet the woodland setting of the tiny house ensures that it is very secluded. There are countless things to see and do during a stay on this exciting island. The hosts offer many recommendations for the best local wineries, shops, restaurants, beaches, hikes, and more upon arrival to ensure that glampers are able to enjoy an unforgettable experience. Some examples of the local activities that guests can enjoy include a visit to Whidbey Island Winery if they are keen to sample some local produce and also a day trip to the delightful park and gardens of Seawall Park in nearby Langley. Since the rental is set in a woodland location, guests can enjoy hiking right from their front door. There are also beautiful routes for taking a longer trek on the island, with the coastline offering stunning trails for both hiking and cycling. Guests can also enjoy spending a long day relaxing in the sunshine at one of the nearby beaches if they are keen to take things easy while glamping. There are various boat trips available, along with kayak and sailboat rentals offered on the island if guests fancy getting right out on the water. Recibirá un reembolso completo si cancela 7 días previos al checkin. Se le cobrará una estancia de una noche completa mas el 50% del coste del resto de la estancia si cancela dentro de los 7 días del checkin. Guests should note that there are steep stairs to climb to reach the bedroom. For entering, a lockbox is located near the front door, which is where guests will find the key. Pets are welcome but they must be kept on a leash and guests must clean up any mess.